Whether it’s your first time applying for a job or you’ve got 30 years of work experience, writing a resume can be a challenging task. How do you convey your great skills, relevant experience and personality in just one or two pages? To make it even more of a challenge, recent studies have found that the average hiring manager only looks at each resume for 6 seconds before deciding if you’re a good fit. You heard that right, 6 seconds! That’s shorter than the attention span of a goldfish. This means that having a resume that stands out from the crowd is an absolute must. Consider it the first impression you make, but on paper. Thankfully, in this digital age, new tools are becoming available to us all the time. Tools like Canva, an online graphic design platform that allows beginners and pros alike create stunning graphics and documents. The best part: it’s completely free to use! 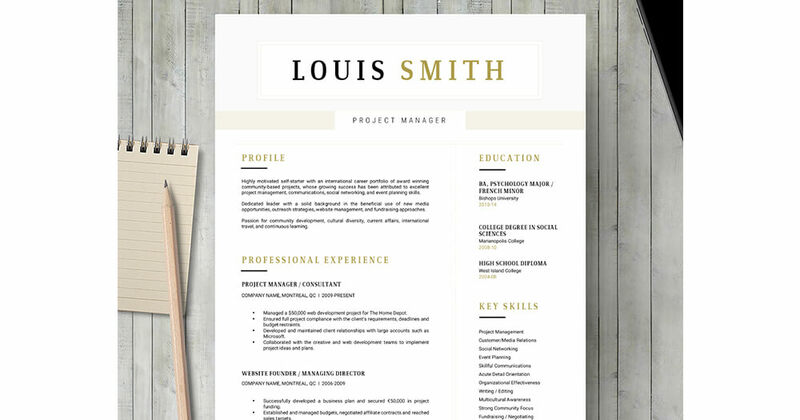 You don't need to have graphic design knowledge to create a unique resume. 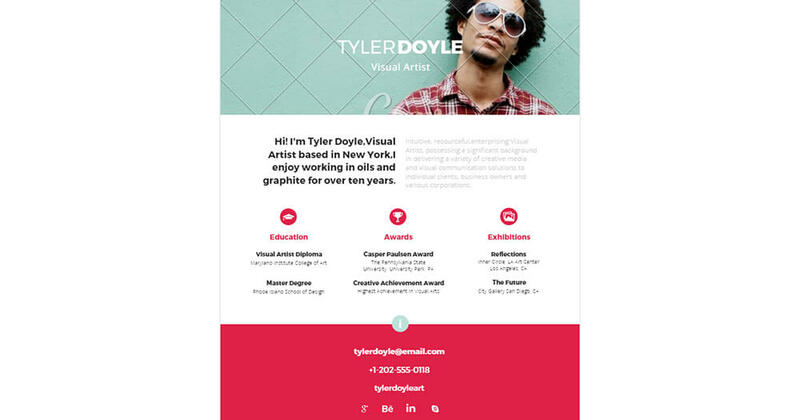 Canva provides the tools to help you design a resume that will get noticed and help tell your story in an engaging way. Of course, the design always depends on the job you’re applying for. A graphic designer or writer will have more creative leeway than an accountant, for example. Luckily, Canva has something for everyone. Let’s look at some up-to-date resume tips for 2016 and how to use Canva to implement them. According to LinkedIn, visual branding is more important than ever, including on resumes. Swapping the professional profile summary for a bold header with bolded keywords, position titles and important dates is becoming more and more popular. This format is easier to skim and scan, and if the recruiter likes what they see, they can go over it again in more detail. You could even use a sidebar, as seen in the design by Ola Hamdy, pictured above. The internet has completely changed people’s reading behaviour. Recruiters don’t read a resume from top to bottom anymore; instead, they skip between sections, scanning and skimming for information. That’s why it’s imperative to clearly structure your document, use white space, headlines and section breaks. 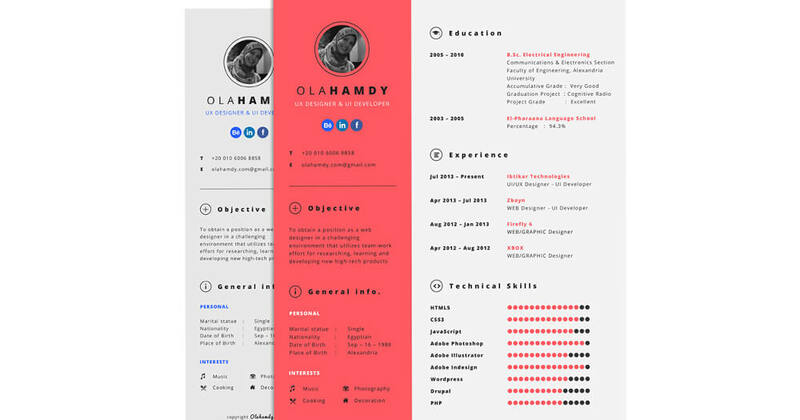 This doesn’t have to be boring, you could use colour blocks like those in the pictured resume template above by Beautiful Resumes. A picture says more than 1000 words. Or does it? HR experts still argue about whether including a photo is must or a no-no. While it does add a personal touch and makes your resume easy to remember, we’d recommend only including a photo for jobs where your personal appearance matters (acting, modelling) or when the recruiter specifically asks for one. If you do decide to add a photo you can use a colour overlay to make it subtler, like in the above example by Egotype. Many job seekers make use of social platforms like LinkedIn or an online portfolio. 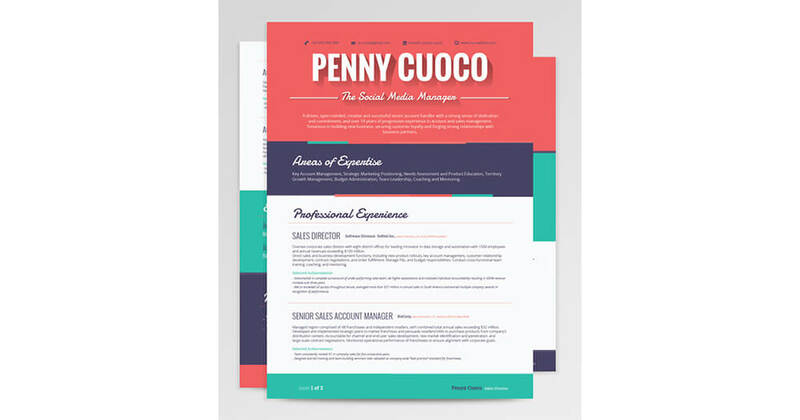 Canva makes is very easy for you to include clickable hyperlinks in your PDF resume. This makes it easier for the recruiter to connect with you on LinkedIn, check out your website or social media presence, and email you. We really like the design of Kyle Robertson’s branded resume (pictured above), and how he includes all of his social networks in the header. Now that we’ve had some inspiration, here are a few examples of different approaches you can take when designing your resume. 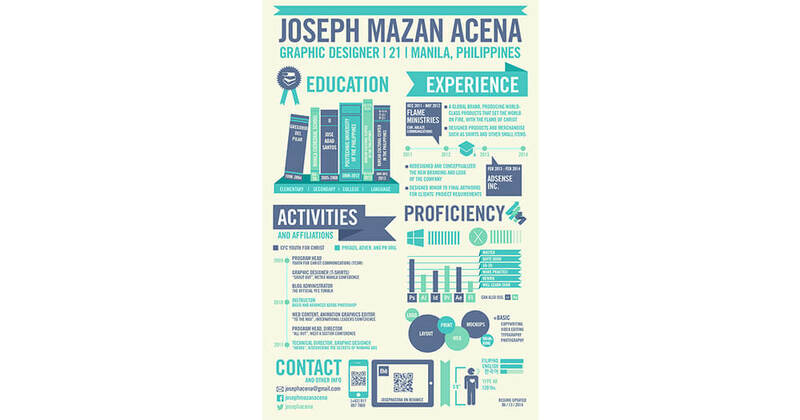 In Canva you can create beautiful, classic text-based resumes. 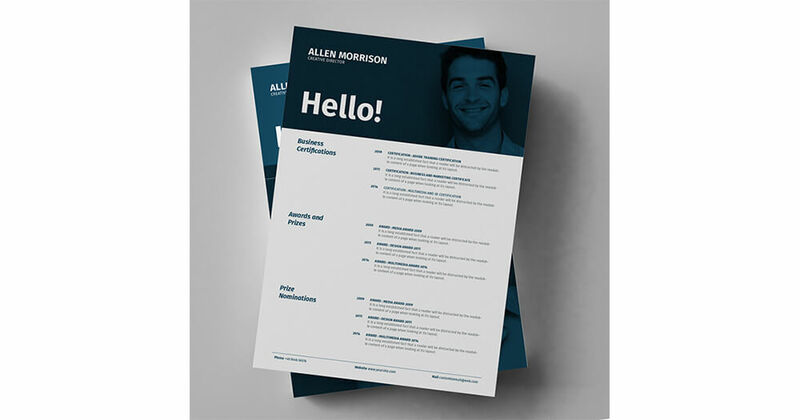 However, by using a more interesting font than the traditional (and out-dated) Times New Roman, or adding a pop of colour, you can still design resumes that stand out from the crowd, like the example above by Creative Market. Designers, artists and architects can get a bit more creative and use blocks of bold colour, patterns or photos; or even a mix of all three. Clever use of icons helps to break up the page and adds a little fun, as in the sample Canva resume template displayed above. 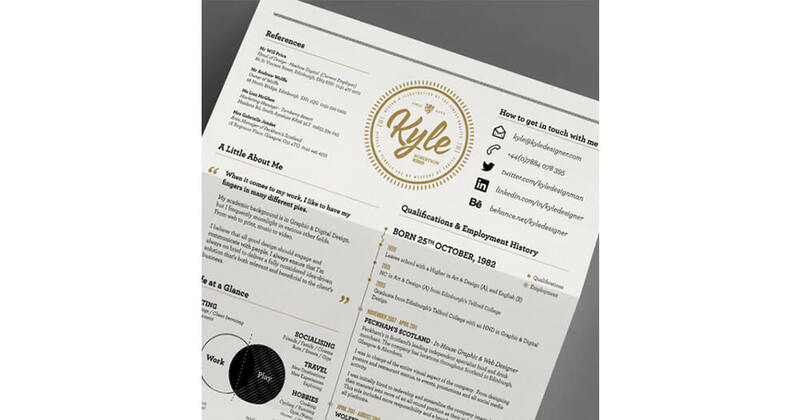 Infographic-style resumes are all the rage now and can be great for tech, graphic design and social media jobs. They are a fun way to display your achievements and represent a lot of data. You should be sure to keep the information clear and relevant. We love this incredibly creative example by graphic designer Joseph Acena. As you can see, there’s plenty of room for creativity when making your resume. Hopefully you're armed with some inspiration and some fabulous ideas now. So go ahead - knock your resume layout out of the ballpark and get the attention of those Hiring Managers! Or want some beautiful, simple, ready-made Word templates? Download three resume templates to suit any industry below.